Its been a troublesome past few weeks. For everybody. But I guess one of the worst hit are the people with weddings in their family. Diwali just got over, and I know a lot of people were out wedding shopping, be it for someone in their family or shopping for themselves for the upcoming wedding season. In our family, we too faced a similar crisis. My sister in law is getting married in Feb next year, and she, her mum and sister came down to Delhi (our home) to do their wedding shopping 10 days back. A day prior to their arrival, news broke that 500 1000 rupee notes over night would lose its status. OOPS ! It didn’t quite affect me and my husband that much, we are from the Paytm karo generation, so it didn’t quite bother us at all. But the minute maasi landed in Delhi, and we were off to our first day of shopping…I realized just how big a mess this was going to be. It is difficult. For the most part, one can plan a uber ride, eat in a haldiram or a McDonald’s but somewhere or the other you need an AUTO ! That + a lot of these shops in Lajpat, Sarojini, Chandi Chowk only accept cash. Well, majority of these shops. So what to do? If you too are facing a similar problem, and yes, this problem of cash crunch is going to be there till at least the year end…then I have a few simple ways of still achieving the maximum shopping output without losing your mind. Here’s how. Your lehenga(s). Your sarees. Outfits for relatives etc. Cosmetics. Footwear. Jewellery. Anything that requires a heavy bank balance. I am saying this because, the market anyways is down. Not too many people are in the frame of mind to shop shop. This is your time. You may just strike a deal (read big discount) because the store people also want their stuff to sell. Everyones business is taking a hit, and you just have to make sure that you somehow manage to bank on this crisis to your favor. We recently went to CTC Mall in Moti Nagar, for wedding lehenga shopping…and we were the only ones at the entire store looking at wedding lehengas. The service hence was excellent, and my sis in law ended up choosing her dream outfit within a couple of hours. We never thought it was possible, but everything went so smooth. The whole store was neat in a way that there were no lehengas lying around in the open…people were not hoarding on to outfits…sales guys gave us their full attention. It was a dream like experience. #2 Complete your venue, caterer, decorator, MUA, Photographer work NOW ! Now because you don’t really have to pay them the entire amount right away. Its the making decisions of menu list, prices, stage look etc which you anyways have to do at some point of time so might as well get that out of the way when the demonetization problem exists. Also, negotiate. A lot of people with (black) money might have backed out and these vendors in some way might have taken a hit because of it…so try your level best to bring down the charges. From what I gather, they will be flexible to some extent. A lot of stores who only operate in cash, and don’t have a POS (card swiping) machine are now giving rthe option of either direct bank transfer or payment through cheques. The other day we were at Shahpur Jat buying some prewedding outfits, none of those stores accepted anything other than cash. I was so shocked. Its an expensive market as it is, can you imagine…they all only deal in cash?! So anyways, my sister in laws did pick out some rather expensive lehengas (upwards 20k) for the smaller events, and like anybody else we didn’t have the cash. But it turns out cheques and net banking transfers are now totally welcome. The whole market deals only in cash. Not only do you need money to commute in and around these markets, you will also need to pay everything you purchase from these places in cash. Something one doesn’t have the luxury of right now. But this is a temporary thing, so the best way to plan this is…by making a list. Like wedding cards, prewedding props, artificial jewellery, trousseau items etc etc, whatever it is you wanted to shop…just put in down somewhere and pick these up last. It so happens that because of lack of cash flow, many stores are not even interested in flashing their good stuff. They know nobody is able to pay, so they are pretty much disinterested. We went wedding card shopping in Chandni Chowk, and I was quite disappointed. Every store had the same stuff, and their was absolutely no bargaining. They all gave us a take it or leave it deal which is usually never the case when you have a crowd hoarding for items. So pick your time before heading to these shopping areas. I mean why not? Your honeymoon shopping can pretty much be covered either through online shopping or mall shopping…so do that. + Getting your skin in order is super important for any bride. Think of this as Modi’s way of telling you that you, your skin is far more important than that shopping trip of yours. Postpone it for a bit, and enjoy the prewedding time in other more rewarding indulges ! If you are a budget bride like me, I am sure you must have planned out or are planning some level of DIY in your wedding. It could be anything from DIY online invitation cards, to wedding decor props etc etc. In case you are looking for some wedding diy inspiration you can click (here). Lets face it, its a lot of fun, will save you a ton of money…and you have fun planning your wedding. 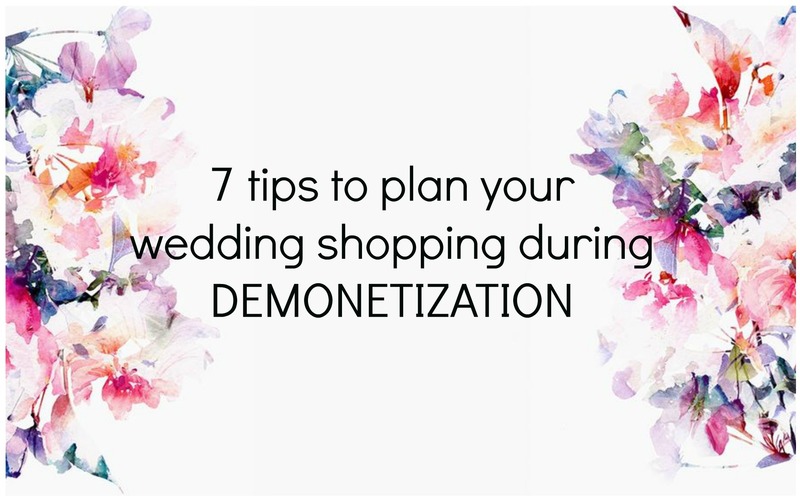 Wedding shopping or planning during this demonetization period is really not all that bad if you keep a positive attitude. Lets not forget that this takes equal amount of planning as well. In most of the cases, we are so caught up with our wedding, that we keep our honeymoon on the side. But quite honestly, a honeymoon is more fun than the wedding stress. It really is. So why not plan it at its best. This is the perfect time. ! How To Plan A Wedding Under 2 Lakhs?